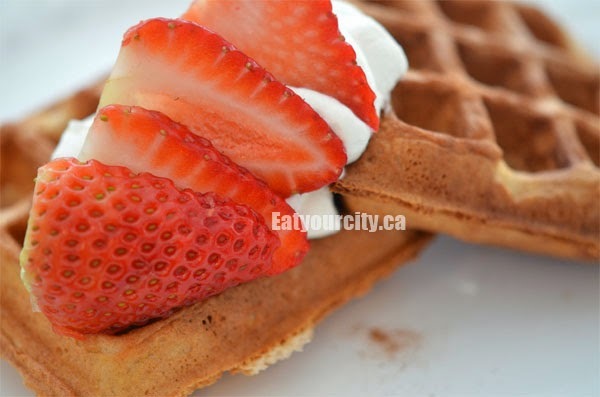 Eat Your City: Best customized Belgium waffle recipes... eggnog, lemon ricotta, carrot cake, fruit and more Part 3 of Breakfast and brunch series! Best customized Belgium waffle recipes... eggnog, lemon ricotta, carrot cake, fruit and more Part 3 of Breakfast and brunch series! Sift the dry ingredients to eliminate lumps… while the actual batter should be a bit lumpy (over working it makes a tough waffle… no sense in leaving huge chunks of flour in at the start! While you can be lazy and mix the eggs straight in, separating them and whipping the egg whites and sugar together, and then folding it gently into the batter makes for a much fluffier, light waffle... rather than a dense brick… lookit all them bubbles!!! 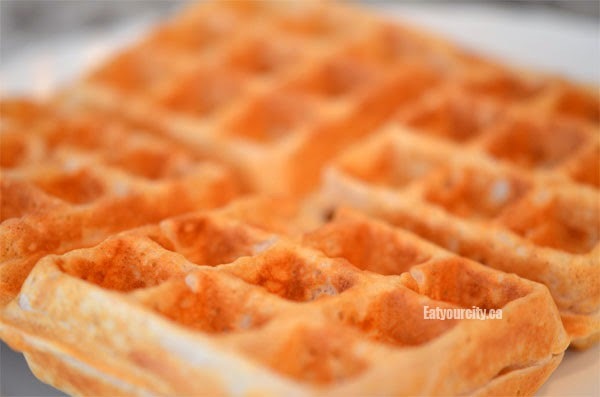 -add cornstarch to the recipe... cornstarch allows more moisture to be trapped in the waffle as it cooks so it doesn't all steam out and leave you with a soggy limp waffle. If you don't have cornstarch, sub out the all purpose flour with cake flour... same idea... the additional stuff added to cake flour will make a crispier unsoggy waffle. 3) Sugar - while tradition calls for pearl sugar - it crystalizes nicely so you get little bits of sweetness when you bite into the waffle, you can use regular white or brown or cane sugar... whatever you have in your kitchen. 4) Vegetable oil vs butter: technically, vegetable oil makes the crispier waffle, but since I love the taste of butter, that's what I use in the recipe. You can have best of both world by using 1/2 oil, 1/2 butter. 5) Buy a half decent waffle maker to save yourself some grief. Ones that you can flip half way are awesome as they ensure the batter coats both sides of the waffle maker and cooks it more evenly. I invested in this Cuisinart Belgium waffle maker that flips easily and its holding up well! 6) Don't beat yourself up if your first waffle is looks super ugly... it make take a few tries before you get the hang of your own waffle maker and have it pop out a perfectly lightly browned all the way to toasted crunchy crunchy brown and crisp cooked waffle! 4) Stir the buttermilk liquid into the flour mixture (make sure the batter is still a little lumpy), then gently fold in the egg whites - careful not to deflate the whites.. you want to keep the fluffy bubbles! 5) Pour the batter (Start with about 1/2 cup of batter for the smallest irons and 2/3 cup for bigger ones... the amount of batter depends on the size of your waffle maker); increase as necessary to fill out waffle into a preheated waffle maker and cook according to waffle iron manufacture’s directions (usually 4-6 minutes). 6) Once each waffle has been cooked, immediately transfer to a wire cooling rack and transfer cooling rack to preheated 200F oven to rest while remaining waffles are being prepared. Serve immediately with maple syrup or other topping of choice.